Das lila Kleid hat es mir besonders angetan, sehr schick! I love that pink dress with the belt! You look very nice! Amazing dresses! I especially love the blue one. Love both dresses, but the blue one really loves you. Loving the spots. Great dresses. Oh so cute!!!! Polka dots are always fabulous, ALWAYS!!!! The wee blue one is just gorgeous on you, you look so pretty in blue. love both your dresses! love the polka dots! Punkte ♥ Das erste Kleid steht dir besonders gut. Both of these belts are fantastic...I love the tiny little black bow, really emphasizes your waist and how feminine that blue dress is. And the gold leaves on the other belt are totally funky and fun! Gives that pink dress an 80s feel that I really like! Ich mag den pink kleid mit blazer! Die Schuhe sind auch toll! Both outfits are so wonderfully cute and girly! I love the classic summer dress cut of the blue and white one, and the hue of the second (that dark pink rarely works on me, but it looks gorgeous with your blonde locks). Very pretty dress! I like your vintage style! Would you like to follow each other? Both of those dresses are gorgeous, as always! 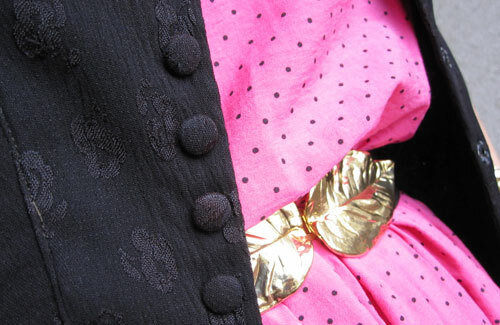 Polka dots are my absolute favourite pattern, so I adore these dresses. And as someone who loves anything vibrant and with a wild pop of colour, I love these dresses. These are all so cute! I especially love that first blue one.